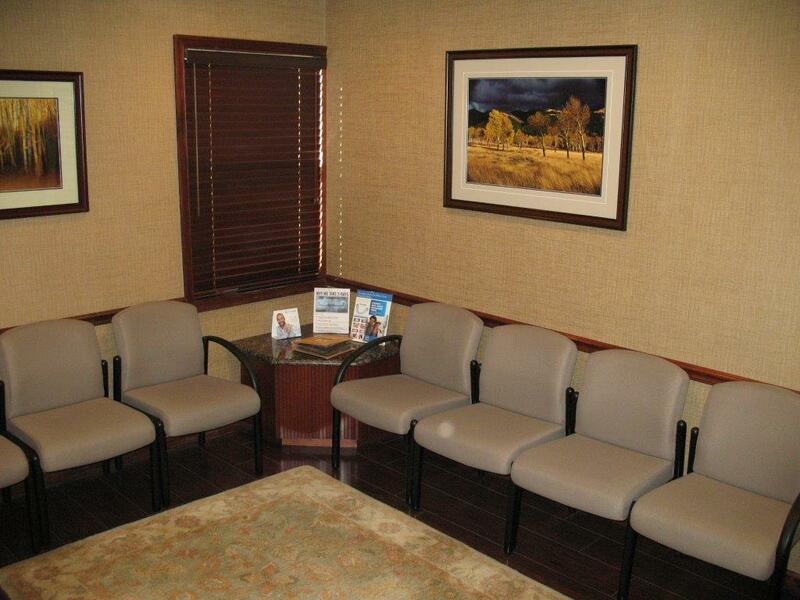 At the office of Dr. Vander Vliet, we believe that your comfort is an integral part of any treatment you receive. We use the latest technology to maximize the results of your treatment and minimize your discomfort during procedures. Technological advances in dentistry make smile enhancement procedures easier, more efficient, and therefore more comfortable for the patient than ever before. So sit back and relax while we create a smile you will love to show! When you enter the office of Dr. Vander Vliet, you will see our dedication to providing a relaxed, friendly atmosphere that is comfortable and inviting to our patients. Our professional office staff will greet you by name, and you will hear the laughter and lightheartedness of people who truly enjoy their jobs and take pride in helping others look and feel their best. You will also notice our impeccably clean yet classy decor, complete with hardwood floors and tasteful decorative touches. As you begin your treatment with us, you will find that our attention to details and small touches help make your experience with us as comfortable and stress-free as possible. Our treatment rooms are designed to be relaxing, with comfortable patient chairs and a light, natural atmosphere. Patients continually comment on our skyscapes a ceiling panel much like a skylight that shows images of the sky. Even when it is cold and rainy outside, you can relax under a bright blue sky and count the fluffy clouds that slowly drift by. We also offer Bose noise-canceling headphones so you can enjoy your favorite music, chosen from Pandora, or you can choose to watch a DVD or Netflix while we give you the smile of your dreams. When your treatment is finished, you receive a warm towel to refresh and revitalize you before you return to your day. We understand that some patients may require a deeper sense of relaxation in order for their treatment to be effective and successful. Therefore, we also offer nitrous oxide for our patients that have anxiety or medical issues. 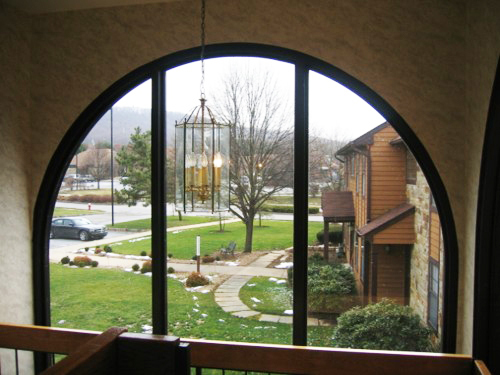 Your comfort is extremely important to us, and we strive to make your experience as pleasant as possible. When you are relaxed, we can perform your smile enhancement more effectively. We care about how you feel, and we want you to feel your best. Experience the relaxing difference we make in your dental treatment. 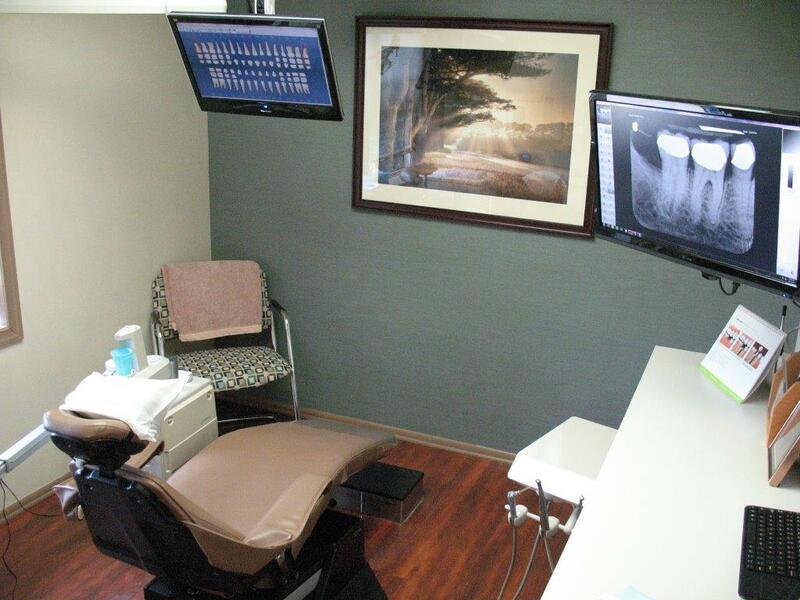 Our commitment to providing high quality care through the use of technology does not stop at the dentist’s chair. Our office also uses technology to save you time and make planning your specific treatment much more efficient. We can electronically submit your insurance claims, making the process much faster and more efficient. If your insurance requests copies of X-rays, they can be sent directly with your claim. Technology also allows us to communicate better with other dental specialists that may be involved in your treatment. We can communicate by e-mail, and documents and photos can be viewed while we discuss the specifics of your treatment plan. Our use of technology saves time for us, saves time for you, and makes planning and receiving your treatment more efficient. We understand that you lead a busy life, and we strive to make the clerical side of your treatment as easy as possible. than traditional dental X-rays, making the procedure safer for everyone. Digital X-rays provide clear, two-dimensional images that can be magnified and adjusted in density or contrast in order to get the best view possible of a specific area. Our panoramic digital X-ray takes a photo of your entire mouth in one shot no more readjusting uncomfortable film tabs and time-consuming, multiple photos. 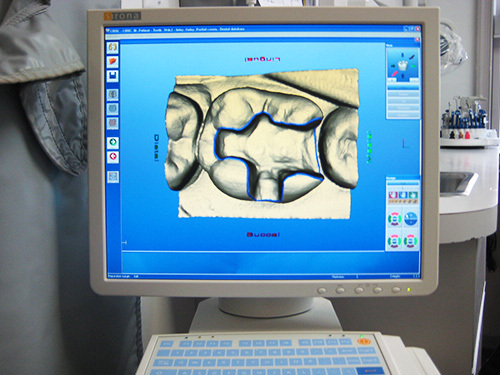 Much like a digital camera, digital X-rays are read by a computer, and can be viewed on a computer screen. They are digitally stored, and can be retrieved on any monitor in our office, even chair side, so we can show you exactly what we see. Our aim is to offer you the highest quality care with the most comfort. Digital X-ray technology allows us to be more efficient, and helps us to provide you with the best options to meet your specific needs. Intraoral cameras work in the same manner as digital X-rays, but they are able to scope out much finer details of your oral health. A pen-sized, camera tipped wand can be pointed at a specific spot within your mouth, and the image is sent directly to a computer, where it is enlarged for easy viewing. Intraoral cameras provide precise images of even the smallest areas, and help us to determine the treatment that is best for you. As with all health issues, early detection is the key to maintaining your oral health. That’s why we use Diagnodent Laser Cavity Detection Equipment. The Diagnodent is a small, pen-like device that can detect even the smallest cavity in its earliest stages of development. The Diagnodent sends out an audible signal when it finds decay, and even provides a numerical readout so we can determine its size. As always, our focus is on prevention and maintaining your oral health. With the Diagnodent, we can find and treat small cavities before they become big problems. The Wand is an innovative way to reduce the pain of necessary local anesthetic injections. We understand that some patients may experience anxiety at the sight, or even the thought, of a dental syringe. The Wand does not look like a traditional syringe, and it certainly does not feel like one. Most of the discomfort associated with local dental anesthesia is not from the injection itself, but from the flow of the anesthetic (Novacaine) into the gum tissue. The Wand is a computer-controlled anesthetic delivery system. It injects the anesthetic much less painfully by controlling the pressure and flow of the anesthesia as it enters the gum tissue. The Wand can also be positioned more accurately to numb only the specific area needed, to help reduce the uncomfortable puffy feeling that is usually associated with Novacaine. Coupled with a strong topical anesthesia applied to the injection site, you may not even realize that you have received an injection! The Wand provides our patients with optimum comfort and helps reduce the anxiety some patients may feel. When you are more comfortable, we can treat you more efficiently, insuring maximum results for your treatment.